Last time we discussed ramen, we dove into the world of tare, the elusive secret sauce responsible for flavoring ramen broth. But there’s one other key component of ramen that rarely gets talked about. And that, my noodle loving friends, is aroma oil. “Oil” here is sort of a misnomer because it really should just be “fat.” Aromatic fat. Almost all modern ramen includes some form of additional fat added to the top of the bowl. Chances are when you look at a bowl ramen, you’ve seen aroma oil’s bountiful appearance. Little droplets, reflecting light, dancing on the surface of the soup as you dip your spoon into the bowl for that first sip. It’s majestic stuff. 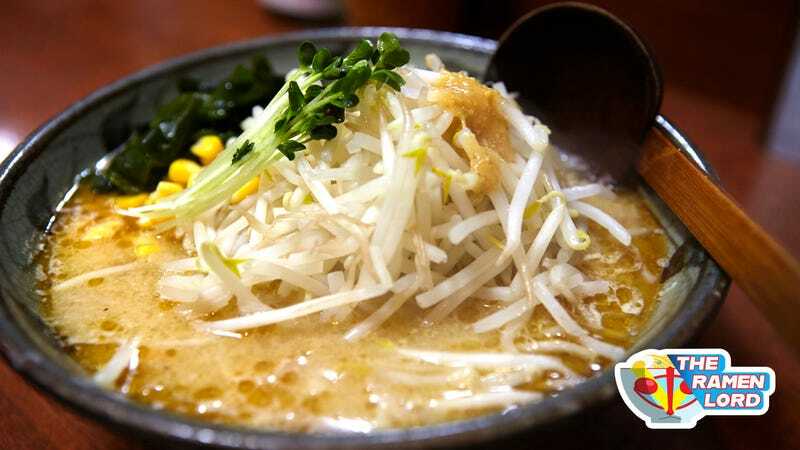 Aroma oil is also another reason also why ramen isn’t exactly good for you—ramen, to put it mildly, is calorically dense stuff and ladling on the tasty fat only adds to your calorie bill. But the importance of fat to the dish can’t be overlooked; by adding some form of fat, a ramen shop adds complexity, flavor, and mouthfeel to their bowl. A number of prolific Japanese ramen cooks I’ve spoken to about this will also argue that fat helps the soup stick to the noodles better. They say fat eagerly adheres to the noodle and coats over small droplets of water-laden broth, suspending the broth on the noodle as they’re dragged up into the hungry mouth of the diner. But who knows? For the life of me, I could not find a scholarly article on this. Speaking from personal experience, though, ramen with added fat is better than ramen without. To me, it is a mandatory component. So we gotta talk about aroma oil. As we always do, let’s start with a simple definition: What constitutes aroma oil? Simply put, aroma oil is fat that’s been cooked with ingredients to the point that the oil takes on their flavors. Aroma oil has this unique property where it can amplify existing flavors elsewhere in the bowl, while simultaneously taming other flavors. Aroma oil is derived from the original cooking process of soup making, where the fat rendered from the meat bones floats to the surface of the pot, mingling with the aromatics and slowly infusing with their flavor. Cooks would skim this fat off and add it separately to the dish. But as ramen became more refined, so too did the creation of aroma oil, with precise ingredients bolstering the fat’s flavor. The ingredients used in aroma oil can vary considerably. Alliums, such as garlic, onions, or green onions, or an ingredient like ginger, have fat-soluble flavor compounds that are readily captured in fat. This is why garlic butter tastes so dang good: All that garlic flavor practically begs to submit itself to the fat it’s suspended in. But you can also make oils from other aromatics. As with a lot of other ramen components, there aren’t a ton of rules here. Chilis, spices, small dried sardines (niboshi), or even shrimp. It just has to be a flavored oil! From my perspective, the ingredients used for the aroma oil are selected to help with layering flavor. I realize “layering flavor” is some buzzwordy jargon a lot of chefs use, but I mean it in a practical application here. For me, layering flavor just means encapsulating an ingredient’s essence in various forms within a dish, often through different components. Take the lowly onion. In a standard ramen dish, it might be poached as it bobs on the surface of the soup, gently bleeding a softly sweet note into the base liquid. But it also might be boiled or fried in the tare (especially in miso applications), or braised with the chashu. Adding oil infused with onion flavor is yet another cooking mechanism a chef can use to include that base “onion” flavor, but showcasing that ingredient’s flavor in a distinct way. Aroma oil is all about layering flavor. Making aroma oil is stupidly easy, which is why I am befuddled when it isn’t included in a bowl of ramen. And such is often the case—unfortunately—on this side of the Pacific (assuming you’re reading this in the U.S.). But even in Japan you don’t always see it: Hakata-style tonkotsu ramen is low-priced stuff, often $4 a bowl, and extremely sparse, so they often exclude the oil entirely. And old-school miso shops in Hokkaido make the “oil” to order, by tossing lard into a wok with vegetables, caramelizing the vegetables and quickly infusing the fat during the cooking of the bowl itself. This fat keeps for ages in the fridge; and you can use it for basically anything. Amp up some fried rice, sear chicken in it, even make a salad dressing with it. You can use this method with virtually any ingredients you like. That’s the wonderful part of it; the method doesn’t change much, just the ingredients. When I write recipes for aroma oil on Reddit, I find my steps for making the oil are pretty much the same. Some folks will argue that you should adjust your temperatures depending on the ingredients used, or even prepare them sous-vide for maximum temperature precision—but really, we’re splitting hairs here. However, there’s one interesting split in aroma oil recipes. Most fats used in aroma oil are either saturated fats (like fats rendered from animals) or unsaturated fats (like vegetable oil). You can use whatever oil you want, but these are two distinct types. And they have some inherent differences worth noting. For one, saturated fats are solid at room temperature. This means on the surface of the soup they tend to have a duller appearance, and they’re more viscous as they cool. If used in too much quantity, they can form a skin on the surface of the final dish. So, rendered animal fats should be heated slightly before being added; and you’ll see some restaurants keep their oils in steam tables for this purpose. The benefit of using a saturated fat from animals, like lard or chicken fat, is that the fat has additional flavor. Unsaturated fats, such as vegetable oil, create wonderful little bubbles of fat on the surface, and they shine particularly brightly. But they’re very neutral in flavor most of the time (sesame oil is an exception of course, but you might not want that flavor in your final bowl). Unsaturated fats, such as vegetable oil (left) create bright shiny lenses of fat, while saturated fats (right) have a duller appearance. The third option is to do what I do: Blend an animal fat with an unsaturated fat. Then you get the best of both worlds: good flavor and a less viscous texture. To give you an idea of what this might look like, below is an extremely versatile recipe for green onion oil. It has three ingredients and pairs with virtually any ramen dish you can think of, since you’re likely to also toss some thin slices of raw green onion on top of the bowl. Combine the fats and green onions in a pot, then heat the pot on medium heat, stirring occasionally until the scallion has taken on a slight brown appearance. Remove the pot from heat, allowing it to cool for a bit, around 20 minutes. Strain through a fine mesh strainer, pressing on the green onions to extract all the oil. Store this fat in the fridge indefinitely. This is an aroma oil I use all the time, particularly on classic styles such as shoyu or shio tare-based ramen bowls. Mayu: An oil made from intentionally burning alliums, typically garlic, by cooking them in oil, and then grinding the alliums with the oil into a fine enough powder that the vegetable dust stays infinitely suspended in the oil, turning it a menacing, righteous black color. This oil is common in Kumamoto but has seen a rise in proliferation in the U.S. If it’s done well, the oil has a wonderful, deep black color, with a smoky aroma. If it’s done badly, you’ll see it separating on the surface of the bowl, with little chunks and specs of burnt garlic everywhere. A little goes a long way with this one, folks. Rayu: Also known as chili oil, the best ones have a bright, almost demonically red appearance, and add a good amount of lingering heat (see photo above). Capsaicin, the compound in chilis and peppers that gives them heat, is fat-soluble. I’ve written recipes for both mayu and rayu, but both start with the same premise that all aroma oils have. Add some aromatics to fat, cook them to till-you-like-it. Mayu is special in that the actual aromatics get pulverized up, but the rest of the idea is the same. And they’re all easy, practically keeps forever in the fridge, and delicious. So let’s get back to adding fat to our ramen!